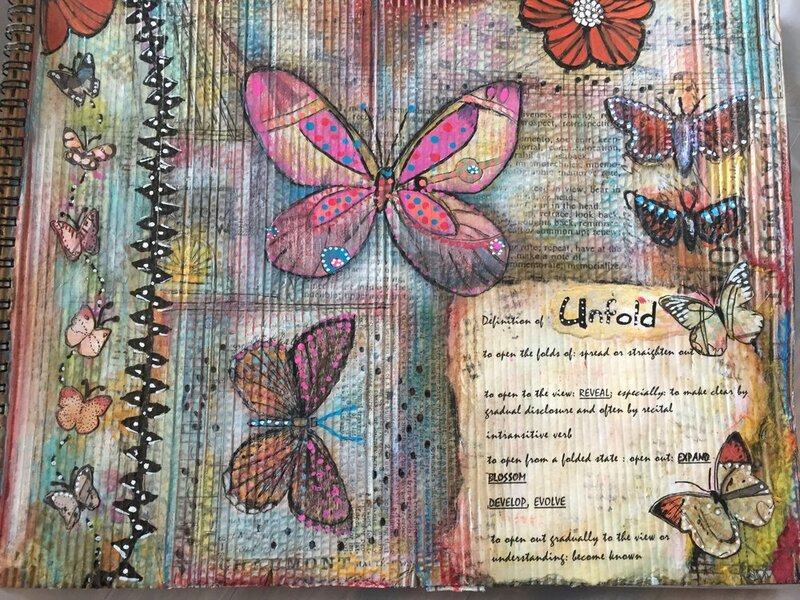 Art journals combine visual journaling (a layered combination of paint, marker, magazine clippings, stamping, etc) with writing & sketching to create finished pages. Every imaginable style, media and technique is used by art journalists. There aren’t any rules, and each book is as unique as the artist who creates it. Mixed media journals are easy + fun, spark creativity and encourage personal expression-- and the best part: there is no wrong way to do them. Whether you are an art journal-er having a hard time making time at home to "play" with your mixed media materials, or are a newbie curious about what it is and not quite ready to invest in your own materials, this is the perfect opportunity for you to come get your hands (and paper) dirty. Kitty will be set up and ready to journal for three hours, join her for the whole time, or stop in for as long as you have. Bring along your journal and anything specific you need to complete page(s) you are working on, or if you are new to this, come try a single page we have ready for you. You'll have access to our large array of supplies and materials, and Kitty's wisdom. Registration is required using the form below. Get your home ready for spring by making these super fun accessories for your garden or windowsill! Join Nicole as for this kid friendly workshop to personalize garden markers for your veggies and herbs. You will have the option to make markers from rocks, metal stampings, and more. No garden? No problem! We will also be decorating terra cotta pots that can be used for flowers or to make a windowsill garden. These could also be perfect gifts for mother's day or spring birthdays. Uniquely decorate your pots using a variety of materials including yarn, paint, and fabric. Guaranteed fun. Each participant will go home with a plant. All ages welcome. In this class, you will be led on a guided chakra meditation and then create a collage regarding a chakra of your choice. This will be done by intuitively selecting images from magazines and creating a uniquely individualized 5”x8” card (plastic sleeve will also be provided for your card). No artistic experience necessary. Chakras are vortices that exist in our subtle body that help us regulate life force energy and has a profound impact on the state of our emotional, physical and mental health. 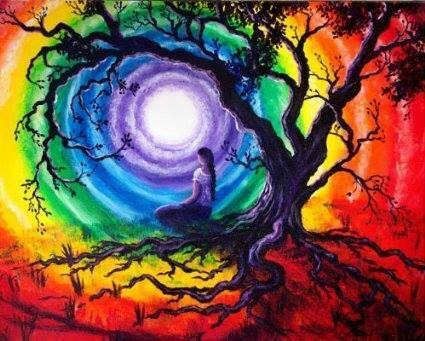 Chakras are multidimensional often holding messages from our subconscious that need only to be discovered. This class will enhance your personal development and connection to your inner self. The class is facilitated by Andrea Sulak, MA LLP. Andrea has been practicing principles of Humanistic Psychology with individuals and groups since 1999. One of her professional passions is working with females to overcome trauma, shame, and low self-worth issues. She also facilitates Chakradance™ and meditative dance classes in the Mid-west. Join Alesheia for this learn-to-paint workshop focusing on an Aurora Borealis scene. Whether you are a beginner or a crafty painter, you will learn some new techniques to create a beautiful skyscape painting. While there will be step by step instruction, we fully expect everyone to add their own flair, creating a final painting as unique as they are. Using acrylic paints and a 16 x 20" canvas panel, come express yourself with colors and strokes. For fun, and to add "that something extra" to our paintings, we will have guides available to create specific tree silhouettes; particularly trees native to Michigan's Upper Penninsula. A perfect + relaxing girls night out. Please feel free to bring your own adult beverages, or any snacks you would like. 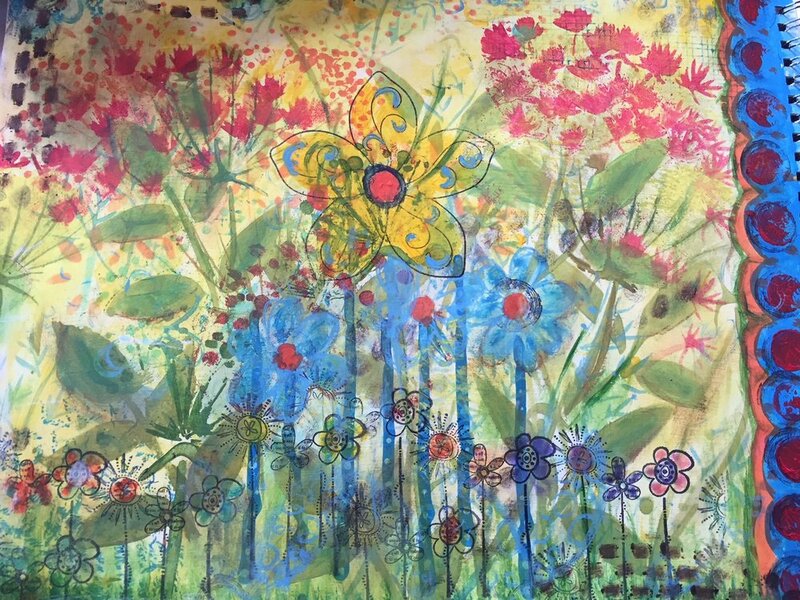 Join Terri & Kitty for this introductory workshop into mixed media art journaling. Mixed media journals are beautiful/therapeutic expressions of your innermost feelings. Open up new pathways and possibilities within yourself as you tap into your inner artist igniting a fire of creativity and confidence. In this very personal exploratory process, there are no wrong lines, no mistakes, and no wrong way to do it, just a chance to uniquely express your thoughts, feelings and artistic style. We will begin with a short meditation, then get our hands dirty as we create one page in our blank journal using our supplies. Participants will leave with a journal of their own, along with a list of supplies needed to continue the practice at home. No experience is necessary. This is a perfect intro to journaling for those who think "I am not creative", for those who love to find new ways to express themselves creatively, or for a positive way to tune in and let out pent up feelings and emotions. It is also a bonus way to recycle old art supplies into a new use. This class is limited to 8 participants. If you would rather pay at the event via cash or check, please send an email to terri@getoffgo.com to reserve your place. With a little expert help, everyone can learn to draw. Join Stephanie for this workshop to create abstract still life photos with pen & pencil. Learn blind contour drawing techniques to improve your visual concentration and help release your fears of doing it wrong. Blind means without looking at your paper, instead drawing consecutive parts of the form to arrive at the whole. No pressure, only fun, as Stephanie helps you draw out your inner artist. Materials are provided, check your doubts at the door. You really can draw! Stephanie is an artist, designer and maker. She attended Rhode Island School of Design where she received a Bachelor of Fine Arts Degree and went on to earn her Master's in Fine Arts from University of Michigan. Stephanie has been successful at many things: artist, illustrator, graphic designer, art professor, letterpress print maker, and business owner--but what she loves most is to help unlock the creative potential of others. Please sign up and pay using the form below, or if you prefer to pay via cash or check at the event, send an email to terri@getoffgo.com to reserve your spot. Kitty will be set up and ready to journal for three hours, join her for the whole time, or stop in for as long as you have. Bring along your journal and anything specific you need to complete page(s) you are working on, or try a single page we have ready for you. You'll have access to our large array of supplies and materials, and Kitty's wisdom. "Grief is a multifaceted response to loss" - a statement can't be more true, and yet still do no justice to all the feelings involved in grieving. Whether it's the loss of a loved one, the loss of a job, the loss of a life you had thought you were going to have, whatever you might be grieving, please join us at Soulistic Sisters to work through those feelings with art, and gentle movement. You're free to work on any project you would like, and use freely of the supplies at the studio. There will also be loosely guided projects + ideas available to those looking to work through specific thoughts or feelings. We will be taking several short breaks during our work to stretch, and focus on our breath and body. At this craft drop in, we will have our card making supplies out and ready to use to personalize your Valentines cards and gifts! Stop by for a few minutes or stay the whole 3 hours and use our supplies (stamps, ink pads, punches, paper) and Alesheia's expertise to make handmade cards for Valentine's Day or any occasion. If you are currently working on your own crafty paper project and need some productive quiet time, bring your supplies in. Crafting with company is a great way to get inspired and make new friends. Join Alesheia for this workshop to learn the basics of modern calligraphy and brush lettering. You will learn a bit about the different tools used, briefly discuss various calligraphy styles and spend time practicing basic lettering strokes, alphabets, and words to get a feel for how to hand letter. Then you will get hands-on with two popular styles of nylon-nib brush markers, which are provided for use during the class. (If you have markers at home, you are welcome to bring them along). Alesheia's February workshops will incorporate an additional skill, heat embossing. Heat embossing is a fun, quick, and surprisingly simple way to take your hand-lettered cards to a whole new level. If you prefer to pay with cash or check at the event, please email terri@getoffgo.com to reserve your spot. Space is limited. Join Alesheia for this learn-to-paint workshop focusing on a desert dusk oasis scene. Whether you are a beginner or a crafty painter, you will learn some new techniques to create a beautiful landscape painting. While there will be step by step instruction, we fully expect everyone to add their own flair, creating a final painting as unique as they are. Using acrylic paints and a 10 x 20" back stapled canvas, come express yourself with colors and strokes. A perfect + relaxing girls night out. Please feel free to bring your own adult beverages. Thank you for registering for this event! Join Alesheia in the studio for some quiet crafting time. Bring your own projects in to work on, or use some of our "easy" art supplies to make something new: rock painting, card making, doodling, etc. We like to schedule studio time to make progress on our own projects, while at the same time open our door to those looking for something mindful and creative to do in the company of other crafty souls. You are welcome to bring along anything you'd like to drink or eat as well, come stay for an hour or stay the whole time and make an evening of it. We'd love to see you! $5 donation for space + material use. NO sign ups needed. Questions? Join Alesheia to learn the basics of modern calligraphy and brush lettering! Cost includes taking home your own custom piece of hand-lettered wall art. Feel free to bring your own adult beverage. Sometimes we all need a little help calming down, focusing and infusing positivity into our lives. Join Sue Ann for this workshop where you will create your own 108 bead Mala necklace and learn how to incorporate it in your current meditation practice, no matter if you are a beginner or a seasoned veteran. Please note: for this workshop will focus on using mantras/short affirmations/personal prayers rather than traditional Sanskrit sounds/words. More than just a beautiful adornment, Malas are powerful and symbolic tools for helping you focus during meditation. All necessary supplies will be provided, however participants are encouraged to bring along any meaningful beads, especially a larger one that can be used as your "guru" bead, to add to your necklace. Register & Pay below or if you prefer to pay at the event via cash or check, please email terri@getoffgo.com to reserve your place. We will reschedule this workshop for later in the year. Whether you love trees or not, you will LOVE this workshop opportunity to create a beautiful and unique tree made with your own hands. Bobbie will guide you through a mindful process of twisting wire, stringing beads and choosing your own color+style combination to create your unique tiny tree. Like all great crafts, the surprise is in the final unveiling as you put all your branches together and give your tree its personality and shape. All materials will be provided, however feel free to bring along any sentimental charm(s) you might have to add further meaning and a personal flair. Use your tree to decorate your own home, or gift it to someone you love. Either way, we know you will be happy you came to create in our studio! Please register using the form below. We accept cash or checks for payment on the day of the event. Join Alesheia for this learn-to-paint workshop featuring a sunrise over the lake. Whether you are a beginner or a crafty painter, you will learn some new techniques to create beautiful landscapes. While there will be step by step instruction, we fully expect everyone to add their own flair, creating a final painting as unique as they are. Using acrylic paints and a flat canvas, come express yourself with colors and strokes. A perfect + relaxing girls night out. $25 includes all supplies. Please bring your own adult beverages. Come learn the basics of marbling surfaces with acrylic paint and specialty mediums. Cost for this workshop includes taking home your own set of hand-marbled coasters. Join Shawna at our Stampin' Up open house to learn all about the art of handmade cards. Join us on Wednesday December 27 to learn all about stamping, applying color, ways you can use watercolor in stamping and cardmaking, using alcohol inks, heat embossing, press embossing, die cutting - Shawna has many talents and so much knowledge! The evening will feature demonstrations on various techniques, and provide each attendee the opportunity to make a handmade New Years (or Winter-themed greeting) card to take home. There will be many examples of beautiful finished cards to see and feel, so you can get a really good idea of what all the different techniques are like - and then you will be able to try them out for yourself on your own creation! The current Stampin' Up catalog will be available to browse, and if you want to purchase anything from Shawna, you can do so during the evening. **Purchase is not required to attend the event, or participate in the Make & Take. A selection of light snacks and non-alcoholic beverages will be provided. Join Terri in the studio for some day after Christmas fun! During the holidays kids are often in toy overload/overwhelm, so bring them into our quiet studio to engage another part of their brain; their imagination & creativity. We'll find something even the pickiest of crafters will like to do. Kids can choose from a variety of hands-on-crafting materials like paper, sticks and stones and then use our large stock of bedazzling items to create their masterpieces. (Parents are welcome to play also). Craft prices vary from $10- $15. Or if you have really little ones who are happy to paint a rock or two, it is only $5 ea. Please register below to let us know you are coming! How many littles will be joining you? Come and learn the basics of hand lettering with Alesheia. All supplies are included, and you will take home your own hand-lettered and filled holiday ornament. Feel free to bring your own adult beverage. At this craft drop in, we will have our card making supplies out and ready to use to personalize your gift giving with handmade holiday cards or gift tags. Use our supplies (stamps, ink pads, punches, paper) and Alesheia's expertise to make handmade cards for Christmas or any occasion. Come and make your own hand painted coffee mugs with direction from Alesheia. Personalized names, quotes or sayings, nature scenes, anything you can imagine can be painted on, or templates will be provided if you find yourself needing some inspiration. Keep it for yourself or give it away as a gift! First mug is $10, each additional mug is $5. This is a kid-friendly event.